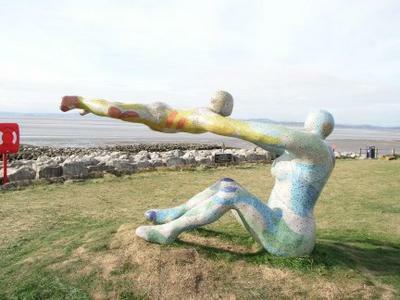 This sculpture is called Venus and Cupid and is situated on Morecambe Promenade near the golf course. I pass it in the evenings on my way to VVV Health Club and I notice that someone has adorned it with tinsel. In the dark the tinsel seems to be part of the artwork as it flutters and catches a little bit of light. It adds to the sense of movement I suppose. I haven't seen it, with tinsel, during the day so cannot comment on the effect.This picture was kindly provided by AC on a Bike~Golden Days. Closer up you can see that the sculpture is covered in tiny mosaic. This link to tarantulastar shows a close up.